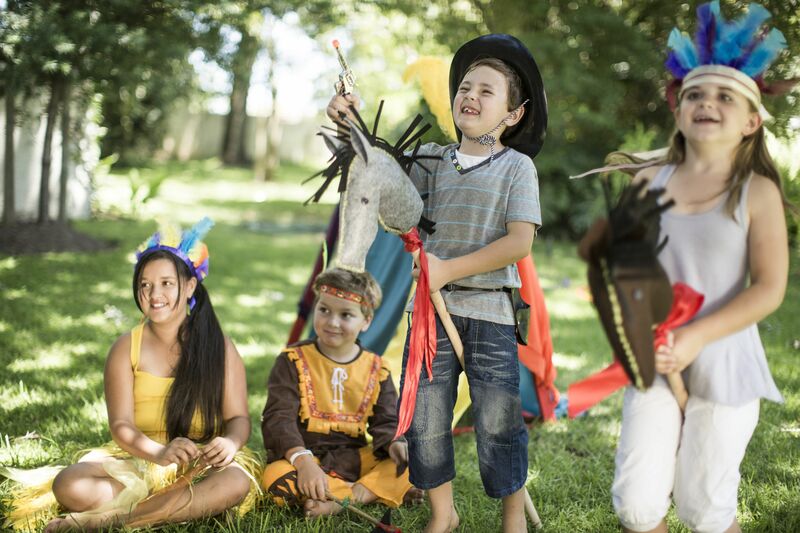 Round up your western pals because it's time to play at the dude ranch with these cowboy-themed party games and activities! Have kids line up and race on stick horses or horses made of pool noodles. They can race one-against-one or split up into teams and race relay-style. To make a pool noodle horse, fold the top end of the noodle over and secure it with twine. Decorate with googly-eyes and a mane made out of fabric, craft foam, or yarn. Fill your play area with balloons. Then set the cowpokes loose on a balloon-popping stampede. Fill the balloons with prizes such as cowboy stickers and temporary tattoos before inflating. Once the stampede is over, kids can go back and collect the prizes. This cowboy party activity requires a little bit of advance preparation. When you send out your western party invitations, include a note that asks parents to email you a photo of their child. Or, you can take pictures of guests as they arrive and print them in time for the activity. Once you have a photo of each guest, mount it on a piece of paper, cardstock or poster board (depending on the size you wish) with the word “Wanted” printed across the top. Leave enough room below the image for the kids to complete the poster themselves. Fold up the cowboy nicknames and place them in a cowboy hat. In a second cowboy hat, place papers on which you have written bad deeds. You can use a combination of traditional wild-west crimes like bank robbery and train hijacking with silly crimes such as stalling at bedtime or burying vegetables under a napkin. Hang the wanted posters around the party area until the end of the event. Then send them home as party favors. Gather your party guests for some old west lasso tossing. Because real lassos can be dangerous, however, you should consider using a hula hoop or rope rings instead. Place a rocking horse or sawhorse at a fair distance from the line where players will stand. Give each player three tries to loop the lasso around the horse’s neck. If you don’t have a rocking horse, try staking a stick horse into the ground. To play this game, set up a few cowboy boots on a table. Draw a line a few feet away from the table. Have players stand behind the line and toss beanbags at the boots. Award prizes to players who can knock over a boot. If you have a seesaw, attach a saddle to each end. Place a child on each saddle and have two adults guide the seesaw up and down. Another way to give rodeo rides is to secure a saddle to a red wagon, bicycle or another suitable ride on toy. Have an adult pull the rider around a rodeo ring or obstacle course. This game is fun for any cowboy-themed party, but might also be especially enjoyable for a Toy Story party. Divide players into two teams. Give each team a cowboy boot. At the other end of the play space, place two buckets filled with rubber snakes. On the signal, the first players for each team race to retrieve a snake, bring it back and place it in the boot. Those players then tag the next players in line, who also race to place a snake in their boots. The relay race continues until one team has had each of its members collect a snake and drop it into the boot. On a sawhorse or table’s edge, line up one tin can per player. Have kids stand a couple of feet from the tin cans. Give each player a squirt gun and a bucket of water for refilling. When you signal the start of the game, kids squirt water at the cans, attempting to knock them down. When a player knocks over his can, he gets to claim a reward from a collection of trinket prizes. Before the party, have your kids paint a collection of rocks. Mix the painted rocks with plain rocks and put them all into a baby pool filled with water. Give kids sieves and have them mine for the gems. You can also play this game in a sandbox. Bury gold-painted rocks or gold nuggets in the sand and have them panhandle for the gold. Pin the Tail on the Donkey is a classic party game that is often changed to suit the theme of a party. In this cowboy version, instead of pinning a tail on a donkey, kids stamp a brand on a cow. Hang up a poster of a cow. Cut a large sponge into the shape of a horseshoe and attach it to a stick. Dip the horseshoe-shaped sponge into some craft paint. Blindfold players and see who can come closest to branding the cow in a pre-determined spot. Pin the tail on the horse. Pin the badge on the sheriff. Pin the hat on the cowgirl. Pin the boot on the cowboy. Gather players into groups of three. On each team, one player sits in a wagon or cardboard box that is decorated like a horse coach. The other two players are the horses who must pull their cowboy, in the wagon, across the finish line. In this game one player is the rancher, trying to corral the cattle. The remaining players are the cattle. Tape off a square on the lawn to serve as the corral. Play begins with the kids running around freely while trying to avoid being tagged by the rancher. When a player is tagged, he must go and stand in the corral. Another of the cattle players can go into the corral and tag him to set him free, but if that player is caught by the rancher while doing so, he also becomes a cowboy and must help corral the remaining players. Play continues until all the cattle players are in the corral and only ranchers remain outside of the box. This same game can be played where the corral is a jailhouse, the “it” player is the sheriff, and the other players are bank robbers. Place a hula hoop on the ground. Have your little cowboys line up behind a line and try to toss their hats into the ring. Award a prize for players who land their cowboy hats inside the hula hoop. You can also draw a large bullseye target on the lawn (use lawn paint) and have the player whose hat lands closest to the bullseye win the game.